This is an unusual walk in that you either have the choice to walk from Par to Charlestown and return via the ‘Hoppa’ buses or main road or chose to trace your steps back on the coastal path. Either way it is most enjoyable and informative. 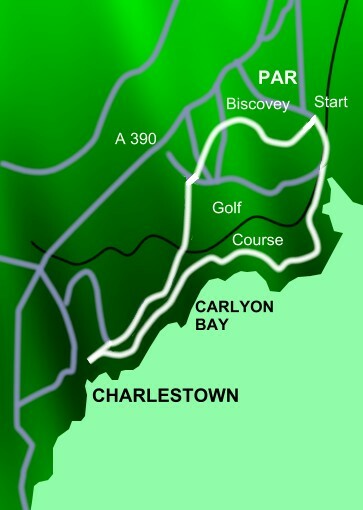 Begin at Par, a celtic word meaning ‘harbour’ or ‘cove’, past the railway line and golf course heading for Carlyon Bay, home to the Cornish Leisure World and entertainment capital of the west. First glimpses of Charlestown Harbour can be obtained from Appletree Point, where it is believed that at one time white monks had cultivated an apple orchard. Charlestown was better known as West Polmear towards the latter half of the 18th century when all activities took place off the beach. At that time it was primarily used for shipping china clay, coal, copper and limestone but later developed into a pilchard fishing and boat-building community largely due to the enterprising efforts of Charles Rashleigh who was responsible for building the harbour. The settlement was subsequently re-named Charlestown in his honour. Tall ships are the trademark of Charlestown today and the harbour area and nearby buildings are often used as a film set by the television and movie industries.